You Say ‘Yam’, I Say ‘Sweet Potato’…Which Is It? Although both yams and sweet potatoes are edible starchy root tubers, there are differences in their outer and inner appearances. Plainly speaking, the red-skinned and orange fleshed tubers we find commonly labelled as ‘yams’ in grocery stores in the United States are actually sweet potatoes! How did this happen? These ‘yams’ were labelled so originally by shippers and producers to distinguish them from the white potatoes, using the English form of the African word “nyami”. And that name stuck. Today, the United States Department of Agriculture requires these sweet potatoes to be labelled with both terms ‘yam’ and ‘sweet potato’. 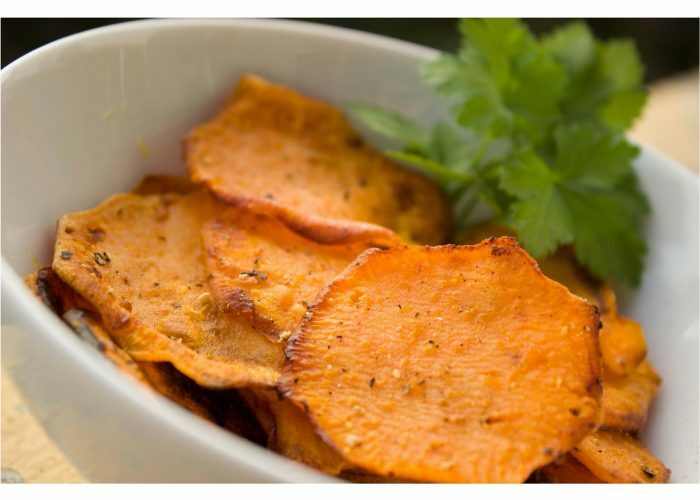 Personally, I think that makes it more confusing…Depending on the specific variety of sweet potato, the flesh of sweet potatoes can actually be anywhere from pale yellowish to a rich orange hue. In the United States there are two common types of sweet potatoes sold: a firmer pale yellow flesh with a golden skin and a soft sweeter kind with a deep orange flesh. What about real yams? According to the North Carolina Sweet Potato Commission, “A true yam is a starchy edible root of the Dioscorea genus, and is generally imported to America from the Caribbean. It is rough and scaly and very low in beta carotene.” So as it turns out, there is more than just a name difference, and the dish we frequently serve at special occasions like Thanksgiving and Christmas is actually made from sweet potatoes, not yams! North Carolina Sweet Potato Commission. What is the difference between a sweet potato and a yam? http://www.ncsweetpotatoes.com/sweet-potatoes-101/difference-between-yam-and-sweet-potato/. Accessed June 20, 2017. Sweet Potato or Yam? Endurance Magazine. Endurancemag.com. November 2013.